The work building a Rebel Fleet continues! 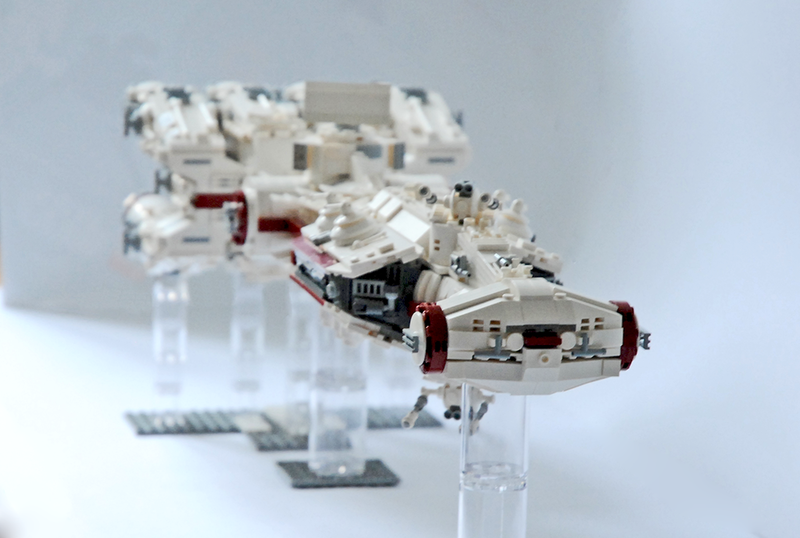 The latest addition the Rebel Fleet is the CR-90 Corellian Corvette, better know as a Blockade Runner. The CR-90 was built by the Corellian Engineering Corporation for the Empire, but many of them were stolen by the Rebels. 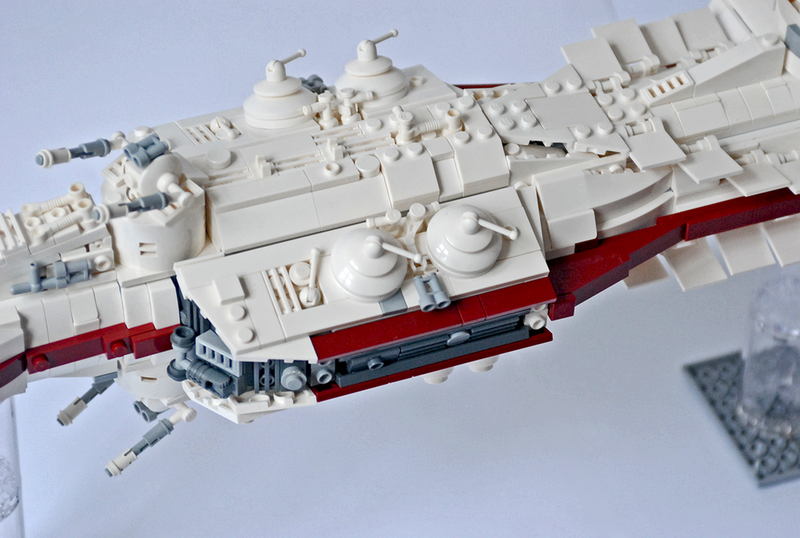 Over time they became a mainstay in the Rebel fleets. This specific rendition is of course Leia’s counselor ship: the Tantive IV. 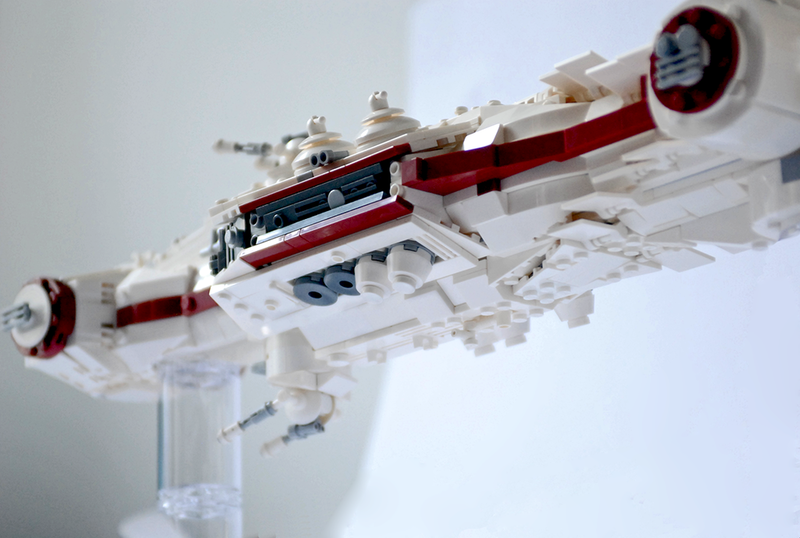 The model is built using the same 2-meter/stud scale as the rest of my Rebel ships and fighters. Thus the 150-meter ship becomes a 75-stud model. My goal was, as always, to capture every little detail of the studio model. However, this time there was also the challenge to improve the two official renditions of the ship. Comparing the TLG versions with the studio model, it became clear that getting the proportions right seems to be difficult - since both version are pretty far off. As always the design process began in LDD but ended in bricks – some things are simply more easily designed in real life :) When I was done the model consisted of just over 2800 bricks distributed across 250 brick types. Model Side View. 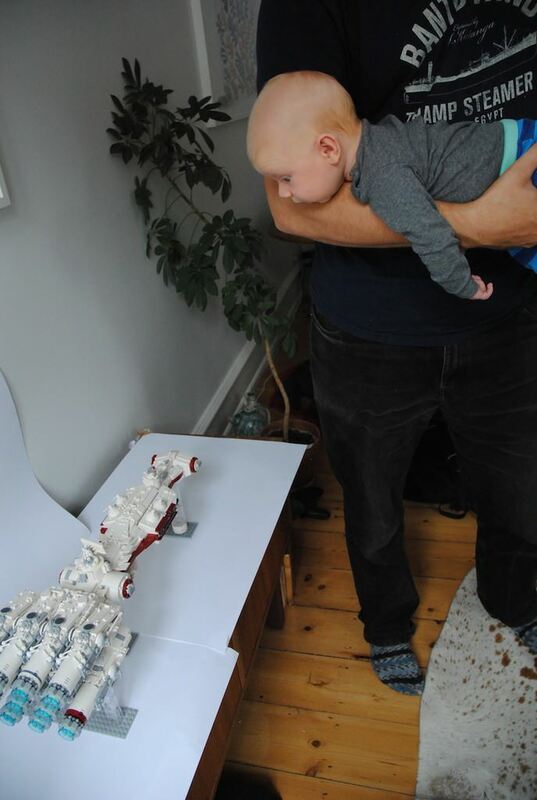 As mentioned above, getting the proportions to fit with the studio model was a priority when designing the ship. Using pictures and diagrams of the studio model, I have gotten with within a pretty tiny margin. The Main Dish. The mold for the main dish is the same as the one used on the two TLG versions of the ship. 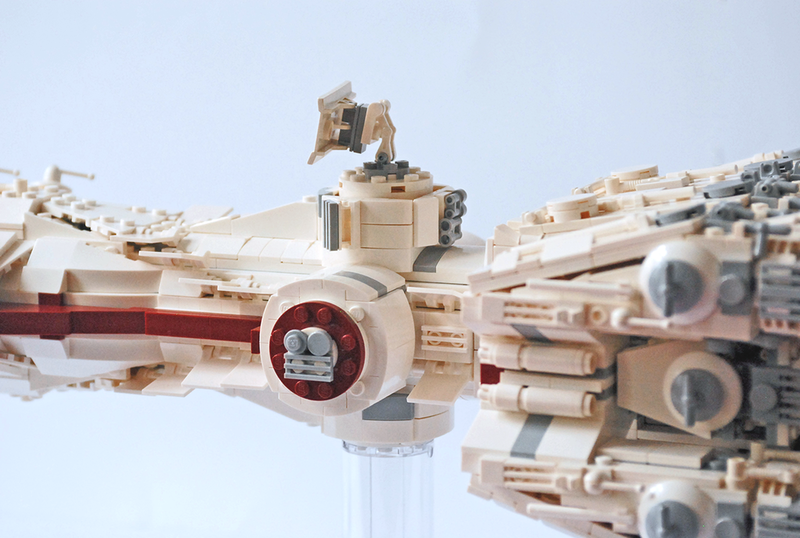 The way it is mounted is inspired by the movie version - using droid arms to get the proper detail. Just below the dish, the studio model has two angled door-like vents on either side of the base. I have recreated this detail using hinges and grilles. On the same base, facing the engines, are also four small, horizontal cylinders – these are visible in the picture below. The area around the antenna sports an almost fin-like structure. The purpose of this structure is to stabilize the otherwise very slender body of the ship – considering the combined torque provided by the 11 Girodyne Ter58 Ion Turbine Engines. I tried to convey this thin structure in a multitude of ways. The cleanest solution I found was using flags. Flags are quite thin and can be placed at the desired angle with no fuss. Using several flags in a row I could slightly adjust the angle from flag to flag to approximate the desired lines. Docking Rings. Beneath the antenna we have the symmetrical docking area. Here we find the docking rings where the CR-90 can dock with other ships. An interesting side note: since the early concepts and prototype models of the Blockade Runner was referred to as the “smugglers ship” aka the Millennium Falcon, the round housings around the docking rings were originally supposed to represent a one floor walkway. 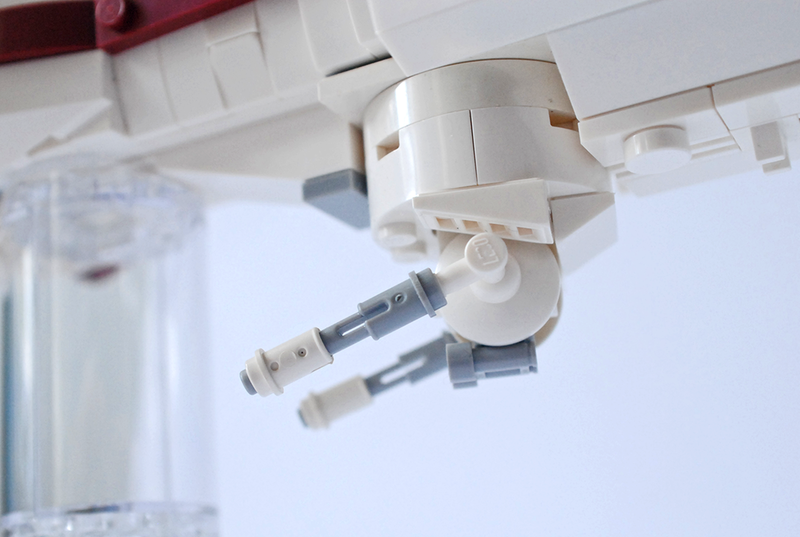 The equivalent on the final Falcon is the side docking rings – in the Smuggler Ship’s original form these we 1:1 with the ones on the Falcon. 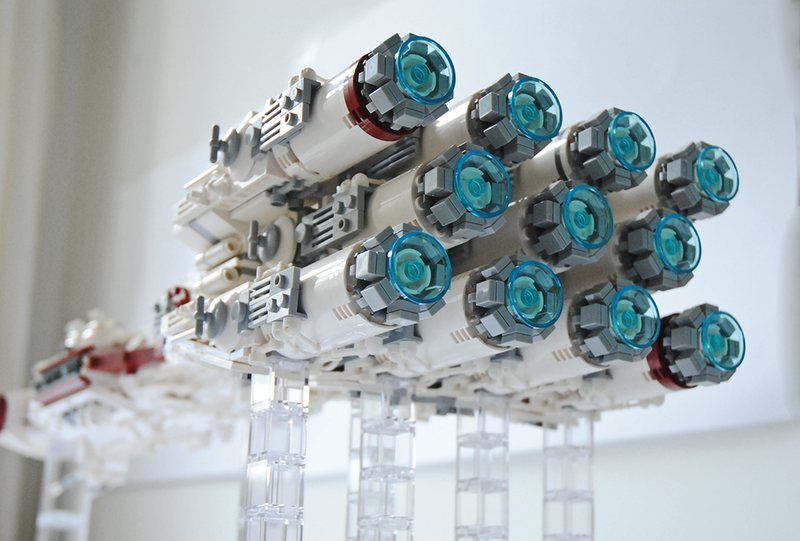 In the final version of the Blockade Runner, the docking tubes are representing several floors of walkways. Main Hull. The main hull of the ship houses the living quarters. We also find a number of smaller anti-fighter turrets. Oddly these turrets are only found on the dorsal part of the ship, rendering it vulnerable to fighter attacks from the ventral angle. This part also sport a bit of discrete piping. On the spine of the main hull is more detailing and I have displaced some of the slopes one plate to give the side of the spine some texture. Escape pods. But who cares about fighter attacks or encroaching Star Destroyers, when you can jettison yourself to the desolate safety of Tatooine’s sand dunes? As you can see, several of the escape pods have already taken off – perhaps one of them were carrying a couple of oddball droids? The escape pods are made up of a 2x2 cone brick with a 1x1 round tile on top. Jettisoned escape pods are represented by a 2x2 round dbg tile with a hole in the middle, to convey the scorching from the explosion that shot the unlocked escape pod into space. Side Detail. On the sides of the main hull there is a narrow band of greebling on the studio model. The band wraps around the entire section and, like with the section itself, I used hinge bricks to capture the different angles. Engines! 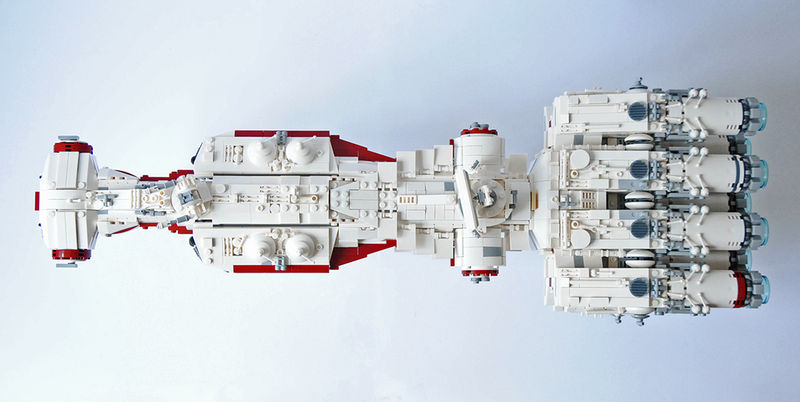 Now to the best part of any ship :) The official UCS version (10019) of the Tantive IV was one of my favorite ships for a long time. 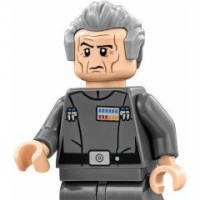 But when seeing the movies, it is clear that the Lego version has some issues regarding proportions. It is very bulky and square looking and does not properly convey the slender nature of the ship. This is especially true for the engine section, which is a large square block with oversized engines placed directly next to each other. In this regard the later 10198 is much more accurate. I my version the engines have the correct diameter and length in relation to the ship’s overall proportions. The horizontal spacing between the engines are ½ engine diameter. The vertical spacing between the three rows of engines are around half a stud. Each engine sports brick built panel with detailing – no stickers :). I used a bracket brick to have the panel run down the sides of the cylinder. Engines Top View. The 11 Girodyne Ter58 Ion Turbine Engines in all their glory! 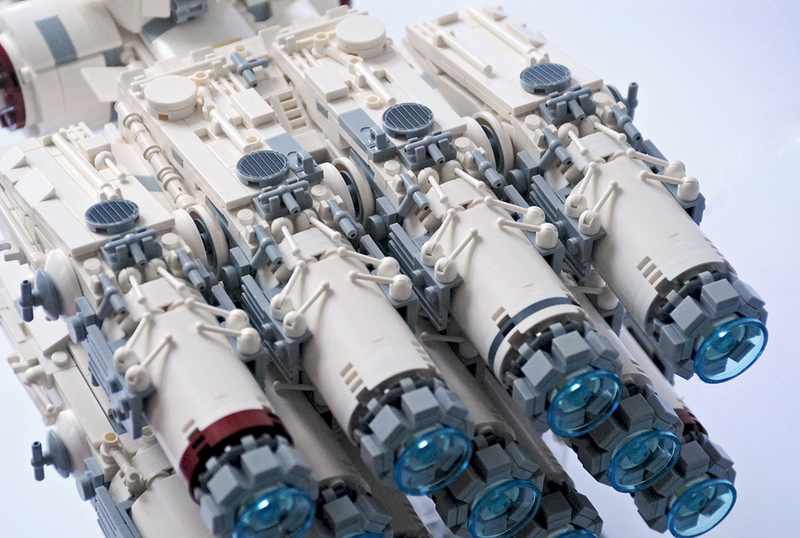 Here you can see all the details and cables on the engines. I considered using rigid cables, but I had to heat them up to get the proper shape. The cables were also too thick. However, I found that by placing a 1x2 bracket in the side panels I could place levers on top of them. The levers convey thin cables running from the sides of the engine to its core. Engines Close-up. The engine housings were also detailed looking at the studio model and as you can see not two engines are the same. It is worth noticing the angles of the engine housings. I have tried to get as close to the studio model as possible, while also taking into account that the side-most engines have a steeper angle. The middle (seen from the side) engine housings also have their own specific angle. These features were completely ignored on the official TLG models and contributed to the 10019’s blocky appearance. Engines Bottom Rear View. As mentioned above, each engine is different. This is not only in terms of detailing, but also how they are attached to the ship. Top, middle and bottom engines are attached differently. Top engines are placed on the top of a plate, middle ones at the end of technic bricks, and bottom ones are attached to the bottom of plates. Since the engines are mirrored left/right not two engines are the exact same. The Tantive IV Flying Away. Nothing short of perfection. Just looking at it, I feel physical excitement :) This has soooo much to look at and such brilliant details, and the colors are spot-on. The dark red parts are just excellent. I don't know what more to say, it is really a stunning beauty you have created there. Fantastic job. Just beautiful, all I can say! Incredible! You sir, are a master! 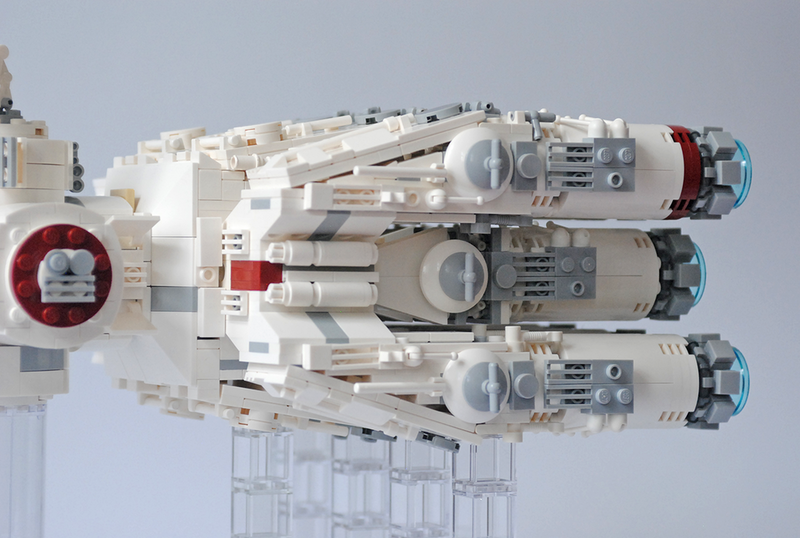 I can only hope you make available your LDD file for us mere mortals to have a crack at this (especially seeing the prohibitive prices of the original UCS)..
About the flags in the middle part - there is some room for improvement there but not with existing parts and not in this scale. All in all - great job, Mortesv! Unbelievable... This is a work of art! 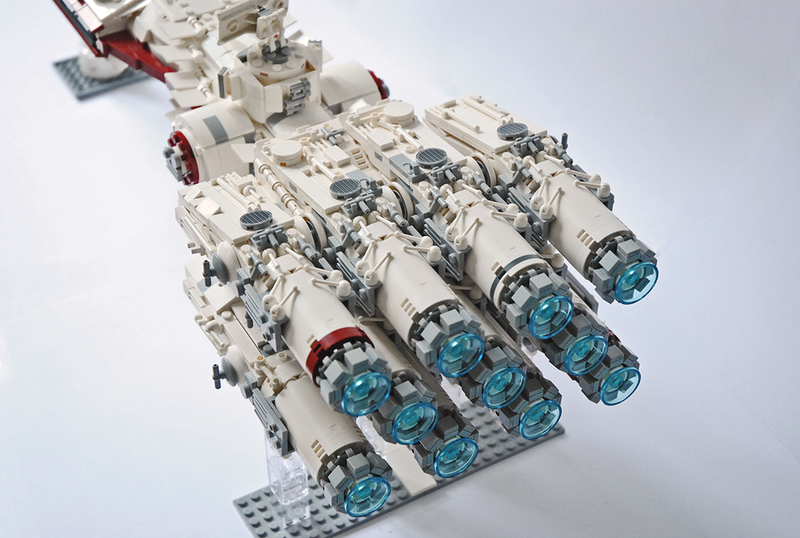 Brilliant build and a very nice write up, which complements it perfectly. This must been an unhealthy amount of work to build! I really appreciate the attention to detail your models have come to be known for. Most people make compromises to incorporate minifigures or playfeatures (yeah, I'm one of them ) but your approach seems to be more of a modelmakers, which I think is a refreshingly different take on Lego-building. I also like the unusual scale this results in. 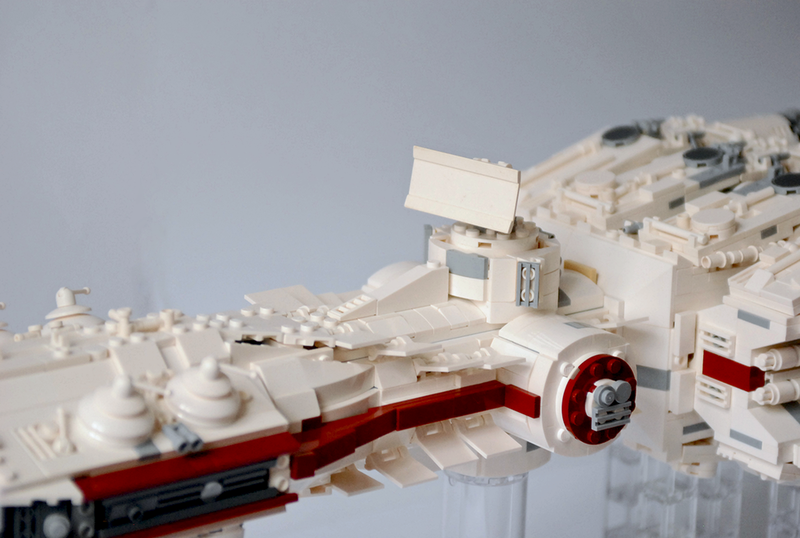 I hadn't realized that even the UCS set was so far off in its proportions. 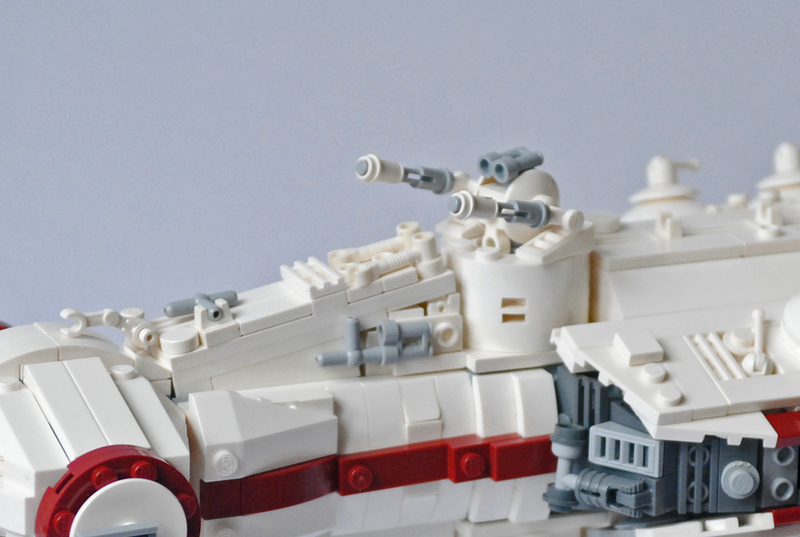 I still think that the Lego Tantive IV sets are a lot better than TLG's take on other ships but the inaccuracies are pretty obvious now that I look at your model. Wow - great use of small pieces & very interessting building techniques! What an awesome job you've done, this is truly excellent. 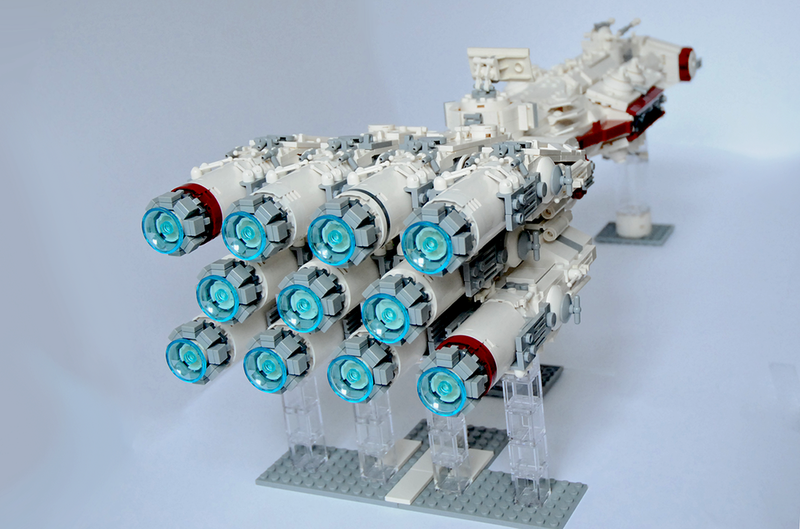 Nebulon B is outside my budget, but this looks very doable! 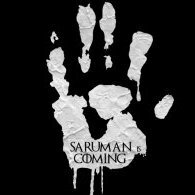 Bring on the LDD! Another great model! 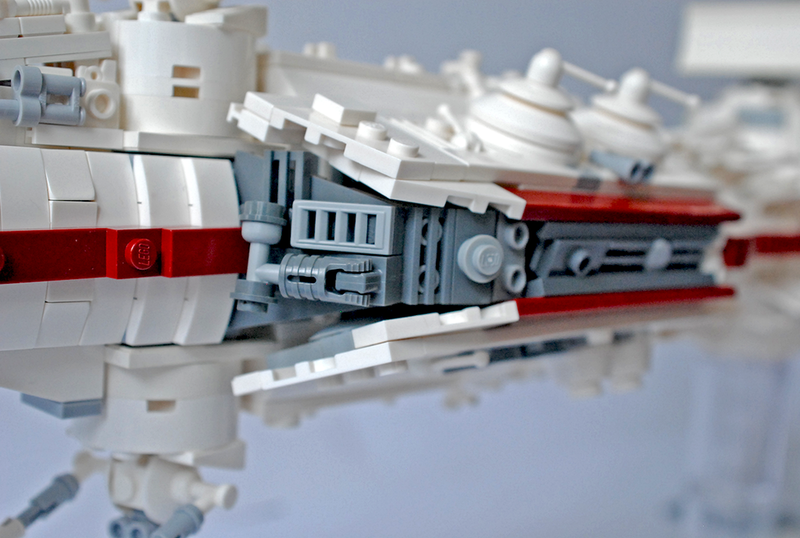 You are certainly a master builder and a very fast one too! I look forward to adding this superb model to the fleet if I can ever get the Neb-B done! "I cant wait to "help" Dad build." Dad can do the constructin' and I'll do the destructin'!" "Whoop-de-doo, I'm a Star Trek fan." Wow - another super effort. Incredible! Another great MOC! Although, please correct me if I'm wrong, is it just me or does the command center look a little small? I think it may just be me because the rest is so accurately detailed! Again, great job. Thanks for the comments guys! I will see if I can do the LDD, right now there is a lot of things ldd won't let me do, even though they are are completely legit techniques. Excellent rendering. I truly admire the level of details yo umanaged to include in your MOC. Very elegant result. What is the length of your model exactly? 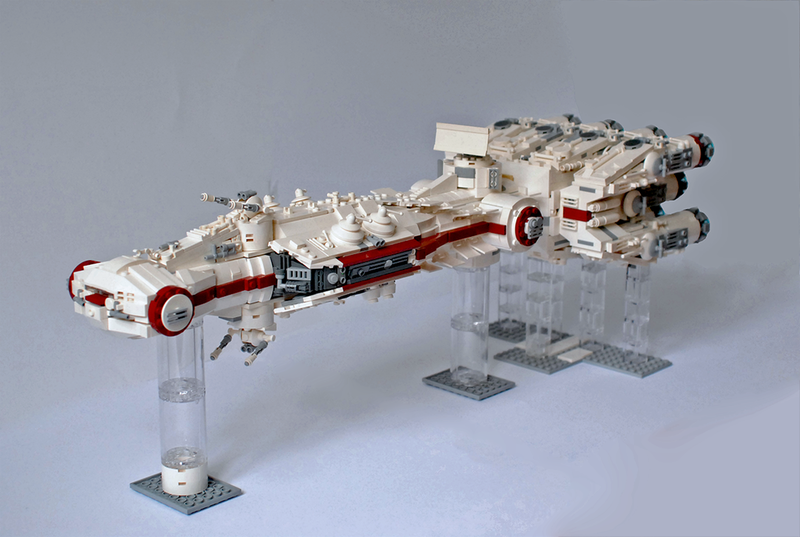 I had also built a large version of the Tantive IV. But I rather concentrated on the playability (ok, with 4.5KG, it became relative). I still improve it and my next step will be to improve the head, using a brick built technic. Nice work, keep them coming anyway! It's looks like a studio replica or something like that. Awesome! Thank you, it is 75 studs, which means 60cm ~ 24 inches. Bigger than the 10198 and a bit shorter than the 10019. I believe your Tantive IV is of the same scale as your Nebulon as well, as in half the length of the Nebulon? 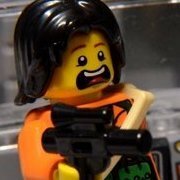 Since Wookiepedia states that the Nebulon is 300m and the Tantive IV is 150m.